Sorry, Penguin, but you're going to have to try again (unless your post was a joke or you look like a triangle). No, but seriously I could see the picture. Maybe it worked at first? I don't know. I liked the triangle picture but this one is nice too. Were you listening to AIO for a special ToO picture? 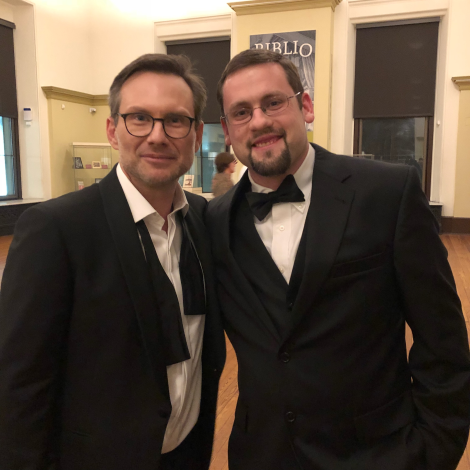 Me (right) at some dapper event, probably a Blackgaard renunion ball. I love the description, but the picture won't show up for me, even when I copied the link into a new tab. If this is a joke because you want me to think you look like a grey circle, then yes, it is working great! I can't see either of them. It's probably because you use inferior Apple products. Last edited by Laura Ingalls on Mon Oct 15, 2018 9:51 pm, edited 1 time in total. Clearly this is all the fault of the dastardly Dr. Watson. I've always had a bad feeling about that shifty character. I am bereft of my photographical skills with out Photobucket by my side any more. You could still use Photobucket if that's your only hosting option, you just can't embed their images anymore. Give a link to view the image on Photobucket and it should still work. Nothing showed up for me in the thread, but when i hit quote and then copied the code into a new tab, a picture appeared! Very nice! It appears that there was a special occasion that you were perhaps a guest of honour at? Nice suit! EDIT: And now that I posted that, it's showing up for me fine now! You are a problem solver, Dr. Watson! Yay! Well, at least it kinda worked! I was at a relative's wedding and got to wear Watsonish attire. Am I physically mature yet? Last edited by American Eagle on Wed Dec 05, 2018 1:34 am, edited 1 time in total. Nope - I'm just an overconfident first-year law student disrespecting a judge's courtroom.